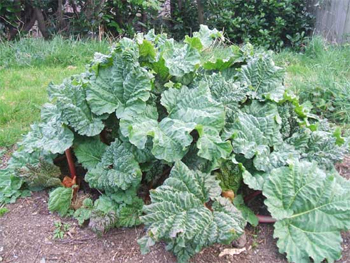 This species of rhubarb is a perennial herb which resembles the common garden rhubarb; the conical rootstock, which is fleshy and yellow inside, produces large, cordate, or almost orbicular, 7-lobed leaves on thick petioles that are from 12-18 inches long. A hollow flower stem, 5-10 feet high, also grows from the rootstock and is topped by a leafy panicle of greenish or whitish flowers. Cultivated outside its native Tibet and China mainly for ornamental and medicinal purposes. Originating from northwest China and Tibet, this herb has been in use for over 2000 years. Gradually it spread through India, reaching Europe during the Renaissance, then into Asia Minor and Turkey. It was a favorite remedy with early Persian and Arabian physicians. The healthy and hardy pioneer families dared to venture into the unknown wilderness on their drive westward in America. They could take only the necessities of life, such as guns, axes, farm tools, seeds, and other bare essentials on this hazardous journey. Records tell us that among the bare essentials the pioneer women included a piece of rhubarb root to assure themselves and their families of this medicinal treatment. Rhubarb came a long way in 4600 years of history from its native home in western China. This is not the garden variety of rhubarb (R. rhabarbarum). The rootstock has a tendency to be both laxative and astringent, depending on the amount used. Helps disorders of the colon, spleen, and liver. Relieves headache, diarrhea, dysentery, in larger doses for constipation, jaundice, liver problems, skin inflammations,and hemorrhoids. Eliminates worms. Promotes healing of duodenal ulcers. Enhances gallbladder function. Antibiotic properties. In small doses, a cold extract of the rootstock used to stimulate appetite. Cold extract: soak the rootstock in cold water for 8-10 hours. For a laxative, take 1 tbsp. 2-3 times a day. For an appetizer, take 1 tsp. 2-3 times a day, shortly before meals. Rootstock: for a laxative, take 1 tsp. powdered or chopped rootstock in 1/2 cup water. As an astringent for diarrhea, take 1/4 tsp. rootstock in 1/2 cup water. These are doses for one day. The leaf blades (although not the stalks) of rhubarb contain enough oxalic acid to cause poisoning. Fatalities have been reported when using the leaves. Prolonged use is not advisable, rhubarb aggravates any tendency toward chronic constipation. 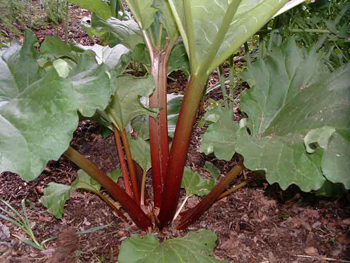 Pregnant women and nursing mothers are cautioned against using rhubarb. Also avoid if gout or arthritis is a problem. Use with caution on hemorrhoids.